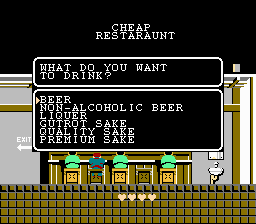 Takeshi no Chousenjou is an adventure game for the Nintendo Entertainment System. 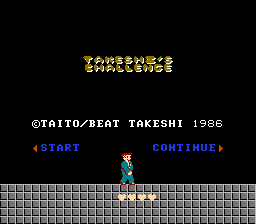 This is an action/adventure game designed by Japanese comedian Takeshi Kitano. 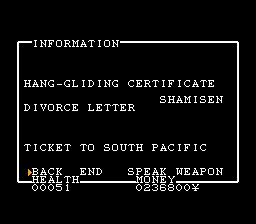 It is rather infamous because it’s a pretty terrible game, but perhaps it was intentionally bad as some kind of prank on the player. Note this translation does use some bad language. Kinda fitting because your dude’s (I’m guessing Takeshi) a jerk. The ROM does need to be expanded first. Get nflate and expand the PRG-ROM to 256KB (there’s no CHR-ROM). 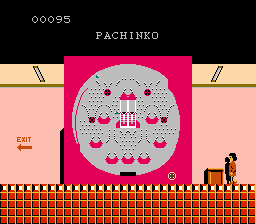 It was tested on the 1986 release of the game, but the 1990 version should be compatible.